Beginning in Tunisia, and spreading to as many as seventeen Arab countries, the street protests of the 'Arab Spring' in 2011 empowered citizens and banished their fear of speaking out against governments. The Arab Spring belied Arab exceptionalism, widely assumed to be the natural state of stagnation in the Arab world amid global change and progress. The collapse in February 2011 of the regime in the region's most populous country, Egypt, led to key questions of why, how, and with what consequences did this occur? 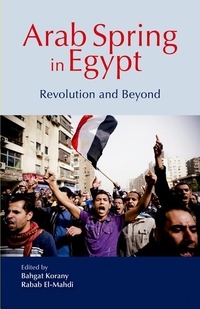 Inspired by the "contentious politics" school and Social Movement Theory, Arab Spring in Egypt addresses these issues, examining the reasons behind the collapse of Egypt's authoritarian regime; analyzing the group dynamics in Tahrir Square of various factions: labor, youth, Islamists, and women; describing economic and external issues and comparing Egypt's transition with that of Indonesia; and reflecting on the challenges of transition.